This page created 28th March 2006. 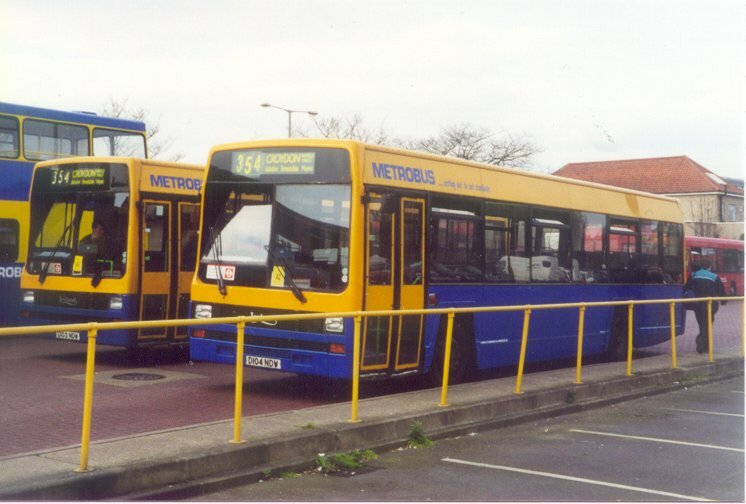 Metrobus tried out a Lynx demonstrator for a few days at the beginning of July 1987. Perhaps as a result Metrobus bought a solitary Lynx (F80 SMC), in September 1988, and put it to work from Green Street Green on the 361 (Bromley North - Green Street Green / Pratts Bottom), replacing a tired Olympian. It also appeared on the 354 (Bromley North - Hayes - Forestdale - Croydon) and on the short-lived 739 (Victoria - Brands Hatch/Chartwell). Two more came in March 1991, secondhand from Miller of Foxton (who had swapped them for a pair of Bedfords and a pair of DMS Fleetlines). These two (F165/166 SMT) had stepped floors. The six Lynxes worked the "big saloon" routes to Croydon (353, 354, 356, 357), and also made appearances on Saturdays on the 261 (Lewisham - Grove Park - Bromley Common /Green Street Green) for journeys to Green Street Green now that the 361 no longer ran. In March 2000 103 and 104 were both on the 354, at Bromley North Station. 104 wears a new coat of brighter blue. The last Lynx was one of the few Lynx II produced: K101 JMV came from the Volvo Training School in August 1992. It featured the extended front and single-step doorway, plus a stepped floor. It joined the other six. By the end of the decade they had been displaced from main line work at Green Street Green (although the Merthyr trio were still there, filling in as spares as required.) The other four had moved out to Godstone, where Metrobus had taken over East Surrey in 1997. The Merthyr trio had a repaint and then joined the others, although 104 had a short sojourn in Lewes on Seaford route 26. After the Crawley takeover some of them moved there in 2002. But their days were numbered. By 2004 they had moved on, the two bought new (80 and 101) being the last to go. 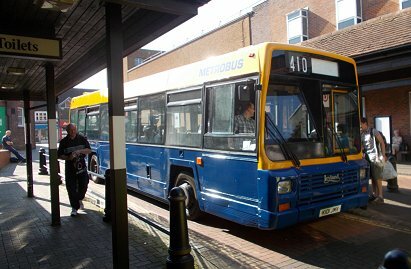 104, 110 and 166 were bought by Nu-Venture at Aylesford in March 2003, while Trustline at Hunsdon acquired 80 and 101. 101 in preservation with the Bromley Bus Preservation Group, at Sevenoaks Running Day on the 410, 18th May 2014. Ian's Bus Stop LX Contents. LX bus histories. LX photo refs. Grey Green.